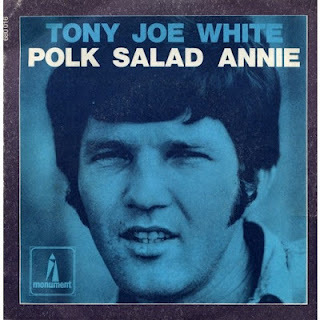 "Everyday 'fore supper time she'd go down by the truck patch, and pick her a mess of polk salad and carry it home in a tote sack..." Here's a little botany lesson for y'all. Polk salad - Phytolacca Americana, also known as poke salad - is a hardy plant that grows in the southern states of the US. Said to be kind of toxic, one should definitely boil and rinse it before cooking. The leaves are said to taste like spinach, while the stalks resemble okra. Polk salad was especially popular during hard times, when people had little else to eat. And since times are tough all over again at the moment, here's a little recipe for you. Also happens that the mighty Tony Joe White wrote a tasty swamprock song about it. And about a girl called Annie of course. "Gators got your granny..."